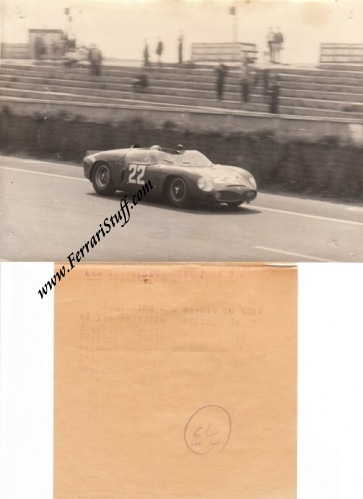 Vintage 1963 photo of Ferrari 250 P S/N 0810 - 24 Heures du Mans - Mike Parkes / Umberto Maglioli. This is a vintage photograph of the Ferrari 250P (# 22) of Mike Parkes and Umberto Maglioli during the April 6 and 7 1963 tests / qualification for the 24 Hours of Le Mans. The duo would go on to finish 3rd in the race with a total of 323 Laps to their name. S/N 810 survives to this date in the USA. This is a so-called "wire photo" which was sent around the world by Interpress from Paris, France in April 1963 and comes complete with a brief description as shown in the scan. The back carries the stamp of Interpress.